It’s coming soon…February 14th, Valentine’s Day. This is the date that people exchange candy, flowers, gifts all in the name of love. Some people call this a “Hallmark Holiday”, a holiday specifically created to promote the commercialism of giving cards and gifts. But, do you really know how Valentine’s Day got its start? Who was Valentine? And how did he get associated with love? One legend says that Valentine was a priest that married young couples in secret, defying Roman laws. He was martyred when his actions were discovered. Another legend says that when Valentine was jailed, he would send letters and notes to his secret love and sign them “from your Valentine”. Sending notes of love and affection can be traced back hundreds of years. By the middle of the 18th century, it was common for friends and lovers to exchange small tokens of affection or handwritten notes. Once printing presses became more common, printed cards replaced those handwritten notes. Did you know that Valentine’s Day is the second most popular card-sending holiday after Christmas? 151,000,000,000 – that’s how many Valentine’s cards are exchanged each year. You probably aren’t making that many yourself, but if you’re going to be making a bunch of Valentine’s for loved ones and friends, you’re going to want something that’s quick and easy to replicate. Today’s card is just that. The Bloomin Love stamp set includes these phrases: Be Mine, Friend, XOXO, and Love You. All four of these phrases fit in the little banner. For the background, I stamped the flower from the Bloomin Love Stamp Set repeatedly all over using Versamark Ink. Have you tried Versamark Ink? This pad is pretty impressive for its multi-uses. 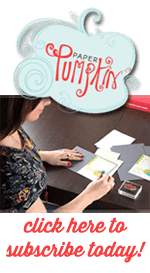 It’s awesome for heat embossing, and it’s perfect for tone-on-tone stamping. Because the Versamark Ink is clear, it becomes whatever color paper you’re stamping on. If I could only have just three ink pad colors for the rest of my life (scary thought, right? ), it would be Versamark, Black, and Brown. I was dying to use the Bloomin Hearts Thinlets. It’s so big and the detail is incredible! Love, love, love this thinlet! 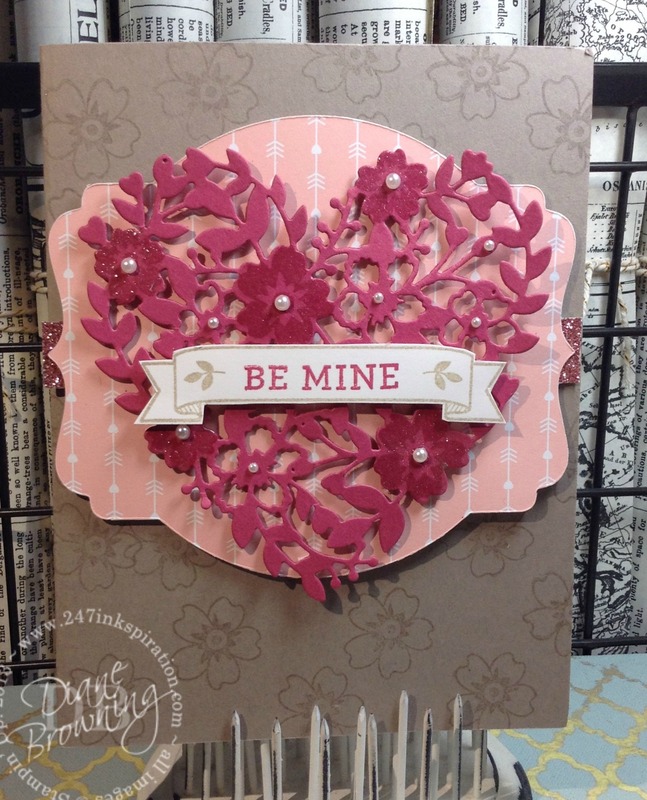 You really don’t need to add a lot to the card when you have this gorgeous floral heart as your focal point. I used my Deco Labels thinlets again because I needed something to show off the Bloomin Heart. The label was cut from the Love Blossoms Designer Series pack of paper. This is a 6×6 stack of paper, which I love. I have no problem cutting into them and using them up. Sometimes I just can’t bring myself to cut that 12×12 sheet because I’m saving it for the perfect project, which of course means it never gets used, because what if what I’m working on isn’t actually the perfect project (don’t laugh – you know you do this too). A brand new product in the Occasions Catalog is the Wink of Stella pens. If you’ve been crafting for a while, you might have already seen these. Stampin Up has them in clear and gold. I used the clear over several of the little flowers to make them shimmer. It’s tough to see in the picture, but they really do sparkle with the Wink. When you use these pens, you want to give your ink a chance to dry before coloring over them with the Wink. To save you from wasting time trying to figure out how to make the pen work (because who reads instructions for a pen), you will need to remove the black ring. Unscrew the pen where the black ring is, take out the black ring, screw the pen back together. Give it a gentle squeeze and you’ll start to see the ink flow into the pen nib. Don’t squeeze the pen too hard, or you’ll get way too much Wink. Always test on a scratch piece of paper, rather than your almost completed project. Once you have the ink flow the way you want, carefully add the Wink to your project. You can always add more ink if you need it. While you might not be sending out 151,000,000,000 Valentines, you can easily do half a dozen of these in no time. You don’t have to save this stamp set just for Valentine’s Day. Any day is a good day to tell someone you love them.